Units FC1 and FC2 are part of a single 5 day course. 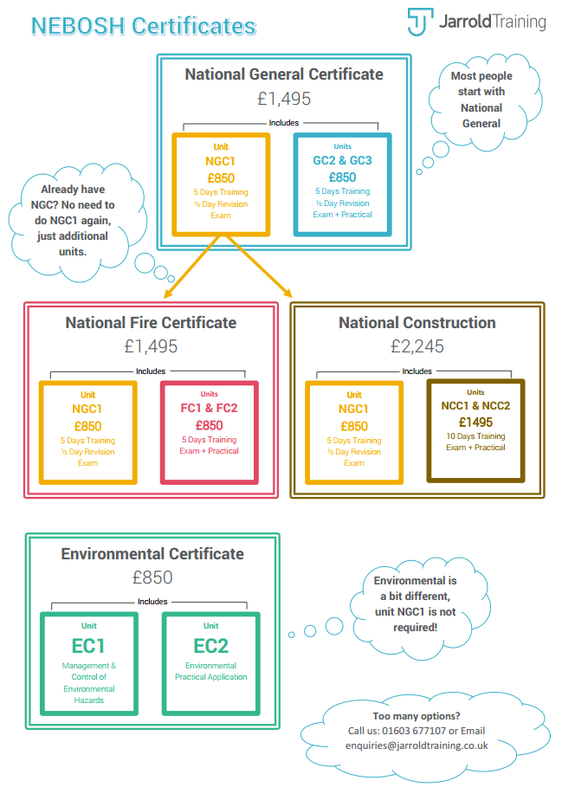 Many people combine this with unit NGC1 they already hold (from passing the NEBOSH National General Certificate) to gain the Fire Certificate. Units NCC1 and NCC2 are part of a single 10 day course. Many people combine this with NGC1 they already hold (from passing the NEBOSH National General Certificate) to gain the Construction Certificate. Units EC1 and EC2 are part of a single 5 day course. This is a standalone certificate and does not require NGC1. What does this look like graphically? Yes. This is the normal starting point for people studying for any one of the NEBOSH certificates. Can I study for a certificate in stages? Yes. There is a 5-year limit between getting the first unit and gaining the other two units for a given certificate. Can I study the units in any order? Yes. Although its usual to study NGC1 first. The remaining units for each certificate are then studied as a pair. For example, units GC2 and GC3 are covered by a single block of 5 days, which when combined with NGC1 will give you the National General Certificate. I can't make all the dates for the course, is it flexible? Yes, up to a point. Training is organised into 5-day blocks, however, revision and exam dates can be flexible. Can you guarantee that I will pass? No. There is a lot of information to learn, and this requires effort and discipline on your part. The trainers are very knowledgeable and have vast practical experience in the field, and in delivering the course, so are ideally placed to help you. Our pass rates are very good! National General, Fire and Construction Certificates are all aligned to level 3 in the QCF.